Well 4 out of 5 ain’t bad… but that last one can make SUCH a difference. PR value and all. Sexist? Absolutely. Poor Bunz could make it up with cute attitude and body language but she just doesn’t know how! The Boss AI didn’t program for that. Stupid machine. Next installment on schedule; yeah, yeah sure. Tell it to the Marines. Moxie knows how to hit the Goons where it Hurts… Especially Bunz! And with LeChat bricked up that about covers the whole lot. Well, we’re done here eh? Nothing more to see here folks. Move along. How long has she been holding that pink plunger? So I figure that Moxie is doing what Columbo once did with a serial cop killer, when he too only had his instincts to go on. He, in conjunction with other cops and their families, faked the death of Mrs. Columbo, to set the trap for the murderess to attempt to kill Columbo himself. Moxie is pushing Bunz’s buttons — not out of meanness — but to get her to attack this cop lady, prior to attacking planet earth. 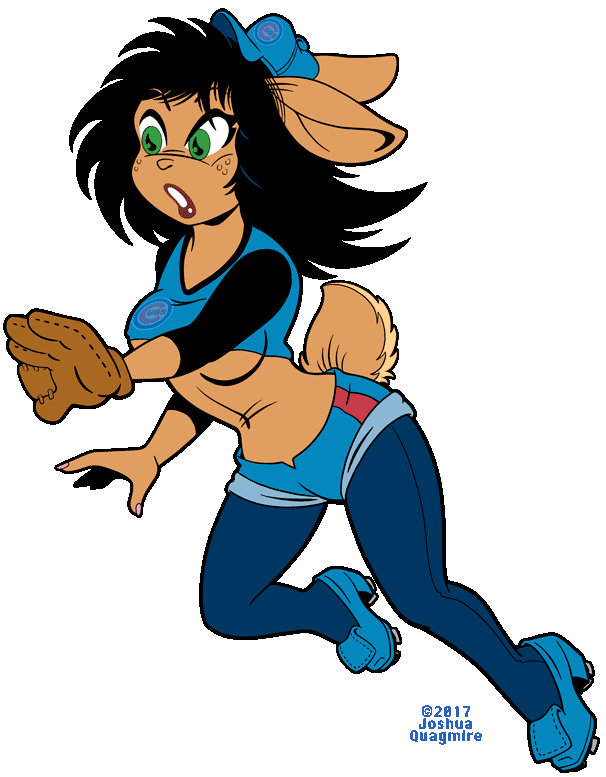 At the end of this adventure, I would expect Moxie to offer to re-style Bunz’s hair as an apology for the bust-line or possibly (guns) remark. Ideally Moxie wants Bunz to call the mother ship for a special favor — to put a Cosmic level hit out on the lady cop. Then, at the least, Moxie has her critical evidence. That seems the plan, but not necessarily the result. Moxie is your creation Josh, much as with the good doctor Frankenstein and his own work. But there might be more going on here than just that. Recall that you suggested that Moxie seemed to have some vague awareness of a “forth wall”. And that this in turn had a bit of an effect on her. Could it not also be, generally to our unawareness, that the deeper ironies of our lives (of which we must admit that we have a few) translate to a still higher level reader of (well) our own stories? Case in point. Moxie relates some fine surface nature qualities known of conventional heroes. Ending with of course it helps to be handsome, or in her case to have say an ample and creamy bosom — or something of the sort that Solomon once so smoothly said. Words like that were her’s. But not her actions. To the nearly totally cynical Bunz she maybe gestured at her breast. But more to the irony here, she actually finished by pointing to her heart. You the artist, maybe with your own faint awareness of a sort of “fifth wall” penned in that tiny (but maybe overwhelming) gesture. The other neat stuff of heroes that were mentioned, wouldn’t help them a lick with “marching into Hell, for a Heavenly cause”. And that was what Moxie (and really you as well) were saying to Bunz. If Moxie is willing to even die for a good cause (despite speaking so shallowly to Bunz) — then will Bunz remain indifferent upon seeing it? The actual heroine of the story, the space chick, has a chance to grow into her own part. I hope that the “fifth wall” people like the story as well. So she catches left and hits right, then. NO! Barracuda says I am NOT ALLOWED to go and see the cute baseball bunny pic. They are vile, distracting and will cause my work efficiency to decrease by 0.0001%! I dislike computers. I hate bossy-pants computers that try to run my life. I figure Heather’s going to be in under the tag. Notice something interesting in the news. It is not even a certain thing that the president himself has the authority to review who had a wiretap on him. And yet 9 unknown sources relate (faithfully) all sorts of details as to what was said by whoever. Yet others swear by all that they hold honorable that “no one” ordered a wire-tap. Hmm, would “no one” be an AI rather than a president, a director, or even a judge? Do we now say, “Yes Sir, Mr. All Wise AI. As you say, so shall it be done.” If that is the case — then no one is lying. On Monday the 6th – The Bunny Ball Spring Training Calendar was Updated! Oooooh but Noooo!!! Barracuda still says I’m………. The rant by B the S has been terminated by the AI as being redundant. Didn’t see any real difference in the two. Clue please?